Paul Hyde is the lead singer for The Payolas, a powerful 80s alternative band he co-founded with guitarist Bob Rock, who has since become a major rock producer (Cult, Metallica, etc). 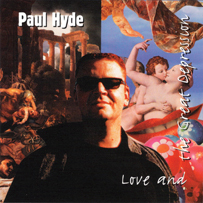 In 1996, Paul released Love And The Great Depression, his second solo album. On a small indie label, it sank without a trace and most of the copies sat in a warehouse for over 15 years. Bongo Beat has rescued this wonderful album and is re-releasing it worldwide.